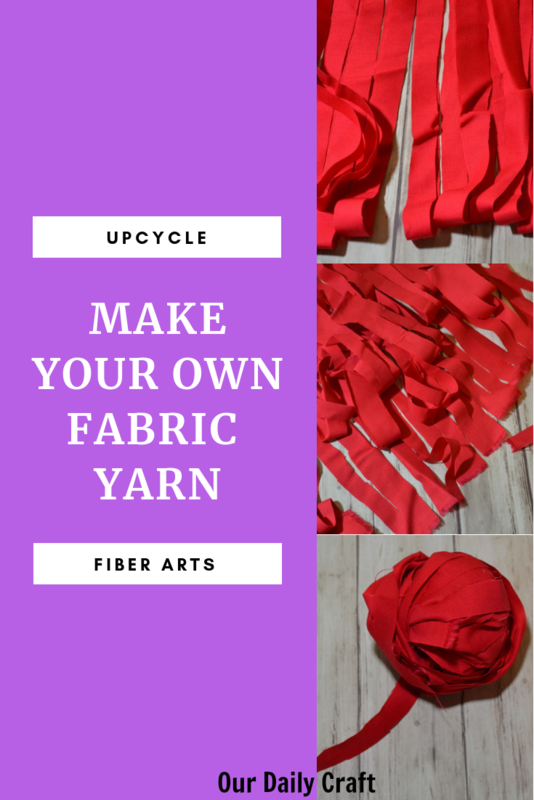 Sure, yarn is available everywhere in all sorts of styles, but it can be fun — and a great way to upcycle — to make fabric yarn out of an old sheet or fabric you don’t like or want to use in another way. I told you long ago about our cat sheet, the sheet we keep on top of our regular sheets because cats are yucky. It was torn and mended and stained and had holes and I finally decided it was worn enough that we should get a new one. But I wasn’t about to just toss out a perfectly OK sheet. Fabric yarn is pretty fun to make, though there is a lot of cutting involved. 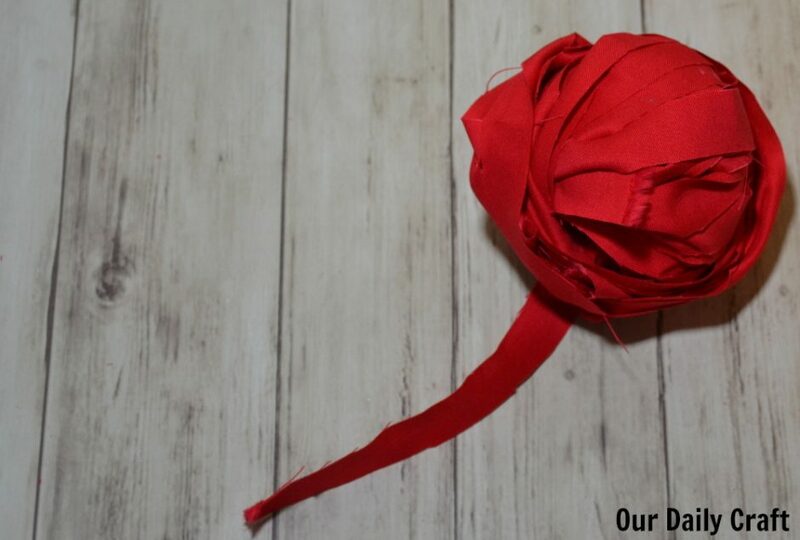 It’s a great way to use fabric that might not be great for some reason, such as being an old sheet that’s kind of falling apart, or something you don’t love but still want to use in some way. A king-sized sheet makes a lot of fabric yarn, and I’ll show you what I made with it soon. 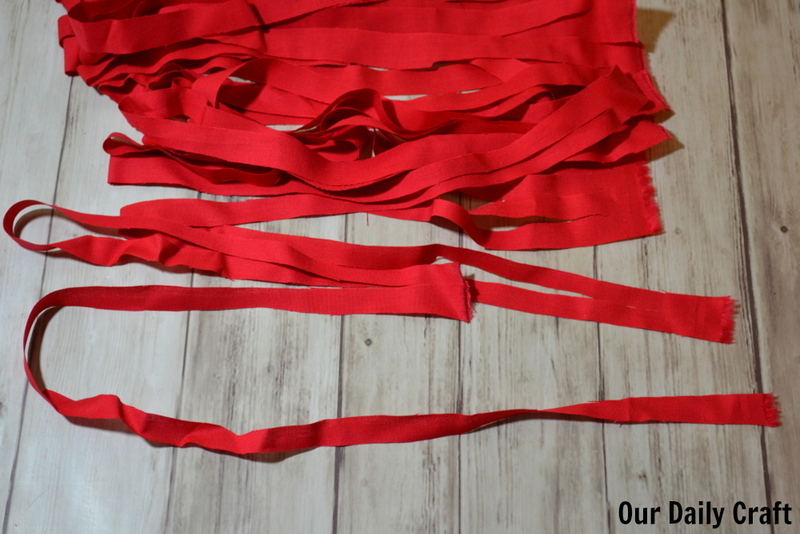 But for today’s tutorial I want to show you how to make fabric yarn in one continuous strip from a piece of fabric of any size. For the purposes of this demonstration I used some of the Ewok hood fabric I had left over from the girl’s eighth birthday. Since that was more than a year ago it’s high time I used it. 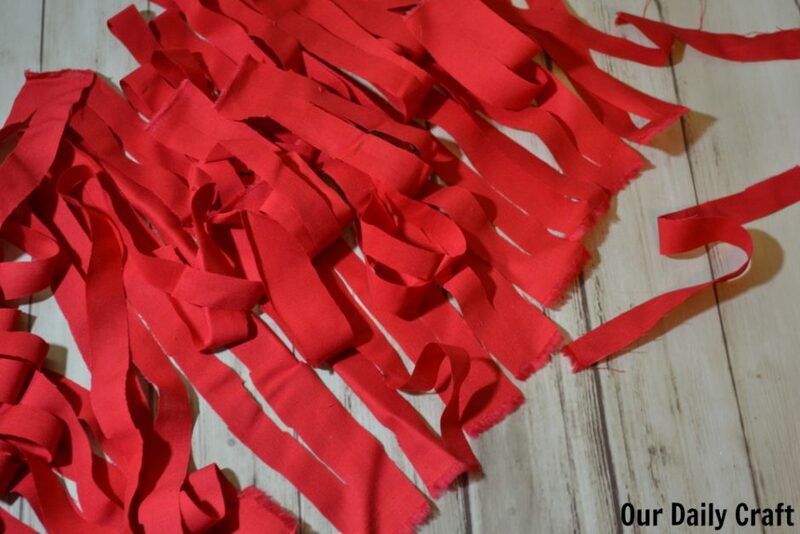 All you need to make fabric yarn is the fabric you want to turn into yarn and a good pair of fabric scissors. 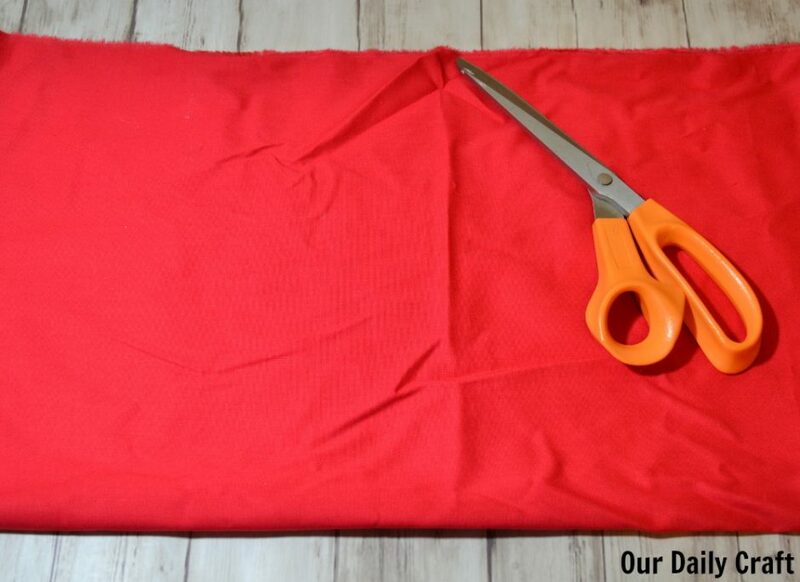 If you want more accurate cuts, or can’t stand the idea of cutting a large quantity of fabric by hand, you can use a rotary cutter and a ruler instead. To begin, fold your fabric in half. If you want to trim the edges so there’s no selvedge or so they are straight, feel free. I’m not super particular. Beginning on the fold, cut strips in the fabric, leaving an inch or so (does not have to be precise) uncut at the top/unfolded edge. When you’re done you will have a bunch of loops that are joined together by that uncut piece of fabric on each side. 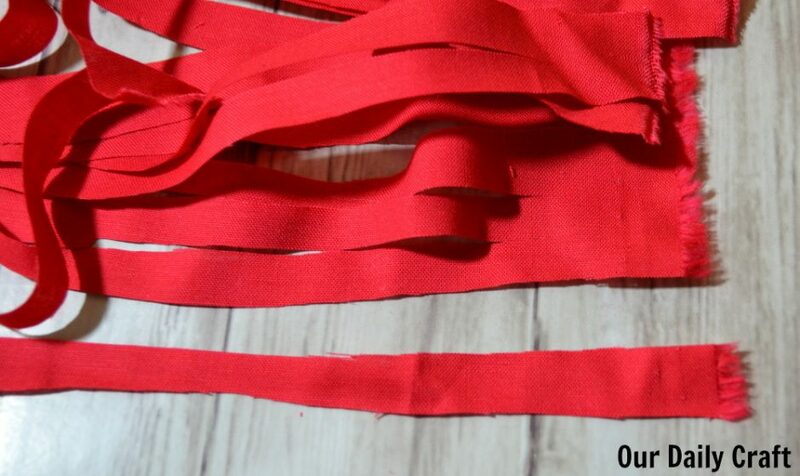 To make the continuous yarn, on just the top layer, cut through the little uncut part of the strip for every other cut that you made. In other words, you’re finishing the cut so that you have what looks like pairs of loops joined together. Do this across the whole top layer. On the bottom layer you want to do the same thing but on the opposite loops. Start by cutting the first loop free so that your yarn has an end. 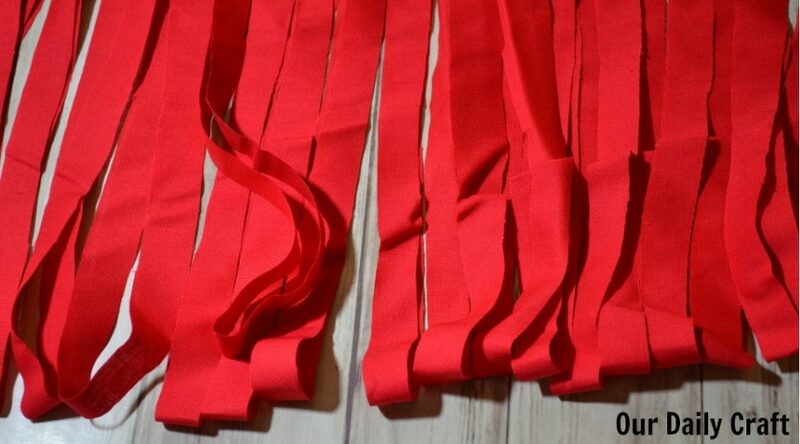 Then cut pairs of loops as before, finishing the cut on every other loop. 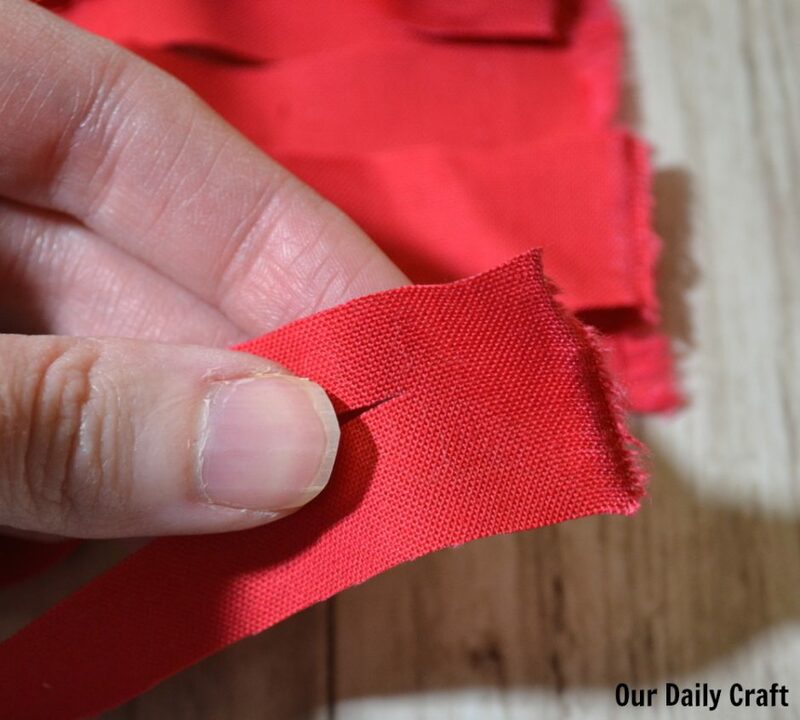 If it helps you to make sure you’re doing it right, you can pull back the top layer and see how it’s starting to make a long “thread” and where you need to cut to continue it. 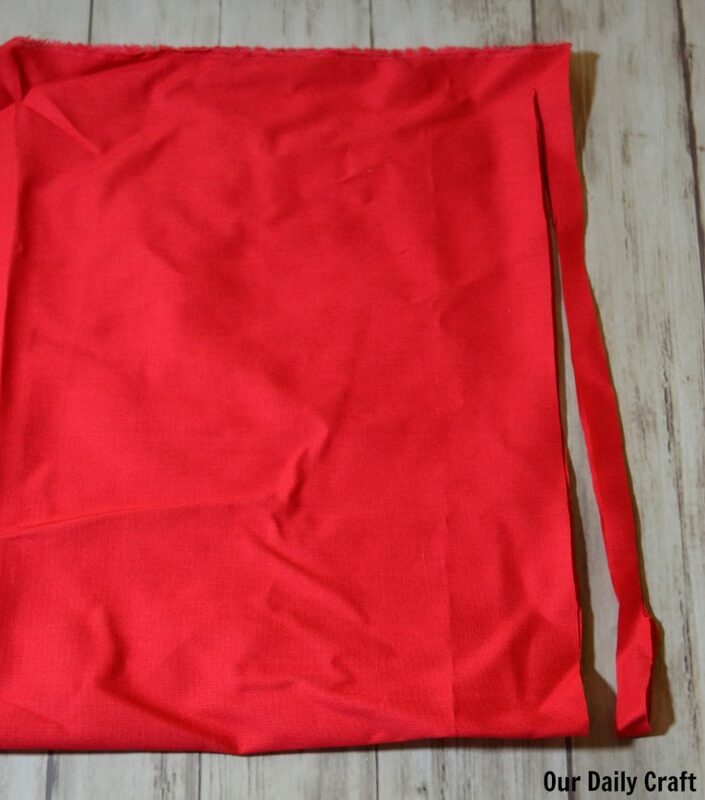 Continue in this manner across the fabric. Fold back the top layer as you go to make it easier to see what you’re doing. When you’re done you will have a big pile of strips. Pick an end and star rolling into a ball. Your fabric yarn is ready to use! That part that you left uncut is what holds the loops together into one long strip. If you find that section to be really large because you didn’t cut as deeply as you should have, you can carefully trim it now. I like to use fabric yarn for durable projects like baskets and rugs. It makes great coasters. A blanket made out of fabric yarn would be unexpected and interesting. You can use fabric yarn for knitting, crochet, weaving — basically any yarn craft you like. Just be aware that unless you were really accurate with your cutting you might not get a consistent gauge or really even-looking stitches. But sometimes that’s OK, right? Have you ever used or made fabric yarn? I’d love to hear your tips and how you used it!